OMG Both are gorgeous!!! I love white romantic dresses...! Looks like a great labor day dress! I can't argue with the choices today. I love this style of dress! This time I will actually go for the Max and Cleo version because they are both so similar! such a cute summery dress. both are cute! Great find! The Max and Cleo looks great and is perfect for summer! This is definitely the dress to have. I'd go for the cheaper one, though. So great for those end of summer things. Great find. The difference seems minimal, I'd totally go with the Max and Cleo version. Sadly I think I already have a few too many little white dresses. Wow, I actually kind of like the Max&Cleo one better!!! Both are super cute though!!! What a cool deal! Love it! Love the Max and Cleo! More form fitting. Aren't white dresses so chic and fun?!! OOhhhh! GREAT comparison Erika! I like the Moschino one better but the Max and Cleo looks almost spot on and a great price! Pretty dress! I love both options! I LOVE the Max and Cleo one -- it's almost identical! I dunno I actually like the Moschino one better! Now THAT is a fabulous white dress. And $76 dollars is exactly what i'd like to pay for it. I can totally picture myself wearing this into fall with some camel color boots, a denim jacket and a great hat. My goodness, it's hard to even tell them apart! Both are gorgeous. These dresses are gorgeous! I love the flared bottom hem of the Moschino, but I really love the price tag on the M&C! I actually like them both! Darling little dress. They look the same to me so definitely would buy the White one. haha the Maz and Cleo. I really like the Max and Cleo! gorgeous dresses really they both are! White dresses are definitely a staple piece. I love the Max & Cleo one. Wow, it's uncanny how similar these are! Wow, that is basically the same dress but with a slightly different hem! 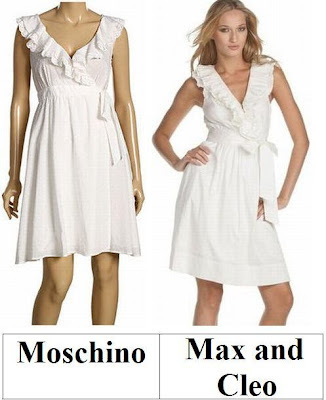 I have to say I'm partial to the Moschino but of course can't argue with the price of the Max & Cleo. I've had my eye open for a casual white dress ever since Carrie's Halston Heritage in SATC2. Thanks for sharing Erika! I love the Moschino dress. I would definitely have to go for it because that hem is to die for. I love this dress and the cheaper version is my bestie! Great find! Both dresses are G-O-R-G-E-O-S! Erika, how do you find these? Seriously? I'd cheap out on this LWD. Mostly because I know I'd spill BBQ sauce on it within five minutes of putting it on. Unbelievable! This one's really good, I can't believe they haven't gotten sued for the knock-off, it's so close! the max and cleo one looks exactly the same!! tightwad, for sure! I think the cheap one is cuter! This is BEAUTIFUL!! Wouldn't this be gorgeous for a bride-to-be at a garden engagement party? Rachel Zoe also just featured a shirt that was also a wrap style with a dramatic collar. Seems to be shaping up to be a trend! They're both so cute! I'd take either one. While they are cute, I'm still trying to figure out how to wear my white sleeveless dress I bought a month ago at H&M. Ugh. No white after labor day, really?? WHAAAT?!?! They are literally, almost EXACTLY THE SAME DRESS. And I really like it. Them. (Oh, I don't know how to refer to it/them - SO SIMILAR.) But white, flow-y dresses are the EPITOME of summer dressing! hey girl, how are you?? great post. you always find the best alternatives. how sad is it that the summers over soon :( what have u been up to lately? im starting to think ive become notorious for disappearing off the blogosphere one month at a time. I love this post! Mostly because I cannot believe I did not invest in my own LWD this summer. But this style is pretty much what I had in mind! This is a toughie but I'll have to go with the Max & Cleo! these dresses are what exactly i am looking for! I love them both. I would have to go with the less expensive one. OMG they are practically identical! If you hadn't pointed out the flared bottom, I would have never known! Hands down, Max and Cleo dress. It's such a cute and flirty summer dress! These dresses look so similar! I'd definitely go for the Max and Cleo version and save some money. It's such a perfect cute and flirty dress. these dresses are both "white hot" and amazing!! Great pics. I love both dresses, they are great for the summer.